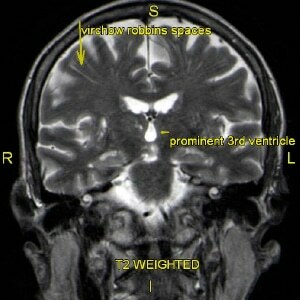 SYMPTOMS: The patient presented after experiencing an onset of dizziness and balance problems. During the initial exam it was revealed that the patient also had hearing changes in the right ear. After in-clinic hearing and balance testing, the otolaryngologist referred the patient to Siker Imaging for high resolution 3T MRI as well as CT of the temporal bones. 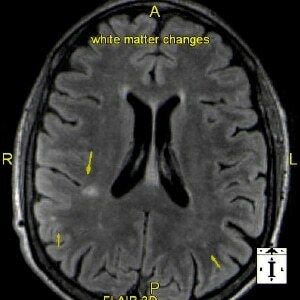 The MRI included a CSF Flow study (used to measure cerebral spinal fluid velocity indicating increase or decrease in pressure). High resolution images were acquired and Dr. David Siker, Neuro Radiologist and Neuro-Interventionalist, was able to determine a number of concerning pathologies including possible NPH (Normal Pressure Hydrocephalus). Images representative of the study including labels and annotations of specific pathology are presented below for review. 1. Mild to moderate scattered supratentorial white matter changes. In this age group, although findings are nonspecific, they most likely represent mild chronic small vessel ischemic/gliotic changes, not unusual for age. 2. 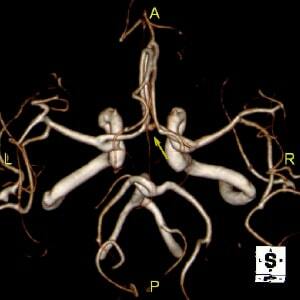 Multiple small lacunes in the bilateral thalami and putamen, chronic in nature, related to prior small vessel occlusions. 3. 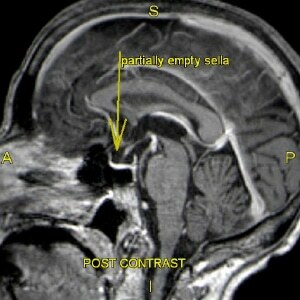 Partially empty sella, sometimes incidental, sometimes indicative of increased intracranial pressure. 4. Involutional changes, not remarkable for age. Although there are no asymmetry components (ventricles > subarachnoid spaces) on cross-sectional standpoint to support Normal Pressure Hydrocephalus, today’s CSF flow study demonstrates increased velocities through the cerebral aqueduct, and I would not exclude this possibility. Strictly from an imaging standpoint, the more compelling findings when reviewing the CT IAC, MRI Brain, and CSF flow studies, are the CSF velocities and empty sella supporting a component of NPH. While the CT IAC suggests dehiscence on the left side, history states that clinical findings are in the right ear. The only caveat to this is a possible small right-sided channel dehiscence. 5. 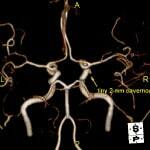 Small, sessile-appearing anterior communicating artery aneurysm (2 mm x 3 mm). This is a low-risk aneurysm at this point in time and I do not believe it merits treatment. 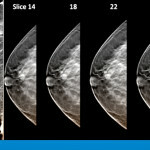 I would, however, reevaluate it in 2 years to show stability with noncontrast MRA. I don’t think it is necessary at this time, but I would be happy to see this patient to review aneurysm findings and reassure the patient about following it.